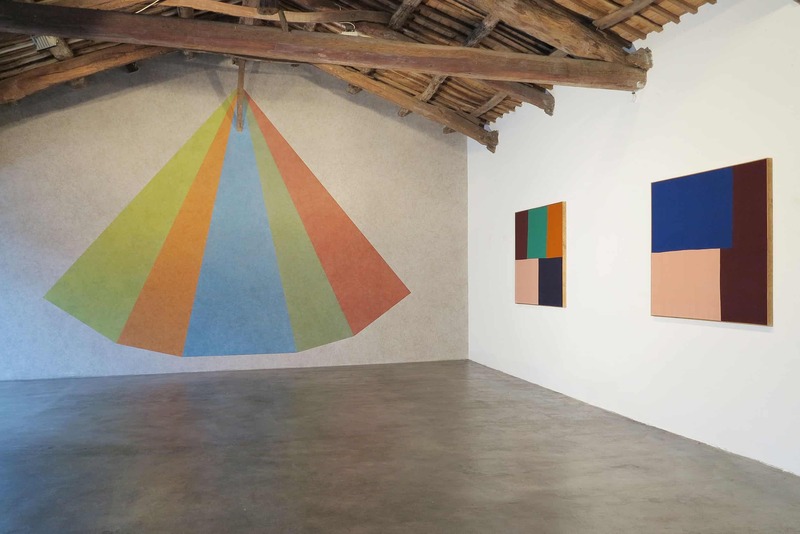 The space, frescoed by Sol LeWitt’s wall drawings, hosts site-specific projects by international artists who are invited to deal with this intimate and memory-rich venue. Mysticism and Logic evokes the famous Bertrand Russell essay, in which he reflects on the synthesis of opposites in the life of man. This is a concept which is also dear to the two artists who will be present in the chapel. Sol LeWitt, in one of his famous Sentences on Conceptual Art, wrote: “Irrational thoughts should be followed in an absolute and logical way” and Ethan Cook, who also reflected this idea in his work in similar terms: “I see my pieces as equations or propositions in which both logical and emotive events”. Mystique, for both artists, therefore becomes a vehicle that can be processed by logic. Ethan Cook is a painter who uses no paint in his studio. His works are composed of pieces of hand- woven fabric that he makes himself with a wooden loom. He is not, however, a weaver. For Ethan, the surface of the canvas itself becomes central to his practice. In his works, minimalist attention to form and colour acts as a contribution to the tradition of abstract painting. Ethan’s working process obeys a meticulous method: the composition of each piece is organised according to what remains from the previous work. Each piece of leftover fabric is used in the subsequent work, an exercise of balance akin to mathematical painting. For the artist, the loom is simply like a printer, where the crafted appearance is not important.